Investors are currently pouring their life savings into municipal bonds, corporate bonds, and long term treasury bonds in search of yield for their retirement income. Most investors now have 75% or more of their portfolio the bond market. They toast at dinner events and discuss the silly gold "bubble" they are hearing about on the news. 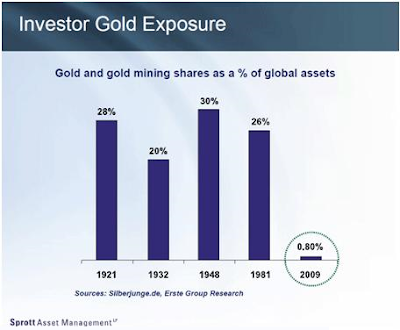 While bonds now represent a massive portion of an average portfolio, let's take a look at the average % in gold and gold mining stocks today compared to the past. Does this look like a mania?